BHSC offers Therapeutic Listening as an adjunct to support a child’s occupational therapy sessions. This is a highly specialized individualized augmentative treatment to expedite facilitation of sensory integration. 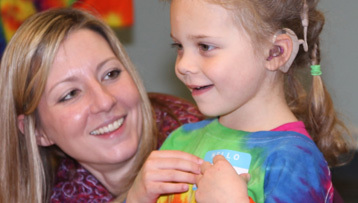 Therapeutic Listening is an enhancement application to your child’s current sensory integration therapy treatment. Therapeutic Listening is not intended to be a stand-alone treatment, but rather to solidify skills facilitated by listening to enhanced music, with a core-based sensory diet home program. Therapeutic Listening enhancement is a fluid process, in that many program changes are made during the course of your child’s treatment with individualized music selections, treatment modifications/adaptations. Sensory Integration is the ability to organize sensory input from the body and the environment and to incorporate it adaptively in meaningful occupations. Many experts agree that the auditory system is a critical link in sensory integration theory; in optimal, everyday listening, we attend selectively to auditory information and integrate it with other salient information from the other senses. Therapeutic Listening is a sound-based intervention that is embedded in a sensory integration perspective. It has evolved from clinical work built on a foundation of developmental and neurological principles. Because the auditory system has connections to many parts of the brain, sound is a powerful way to access the nervous system and affect changes. Therapeutic Listening involves listening to specifically recorded and enhanced music on headphones as part of a daily home program. The program is highly adaptable to the specific needs of the client. 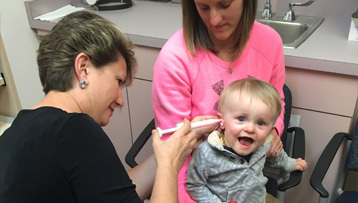 The choice of music, type of modulation, listening time, and individualized activity program vary depending on the treatment goals and needs of the child. By monitoring the child’s progress in Therapeutic Listening, the therapist is able to change and adapt the child’s individualized program to meet treatment goals. Please call the clinic occupational therapy extension to find out more information or to make an appointment. 716-885-8318, ext. 4154. After learning about the services, I spoke with my child's occupational therapist and we both agreed he could truly benefit from the therapy. Since he has been attending program, we have seen improvements with eating, hyperactivity, following directions, self-grooming, trying new activities, activities involving vestibular senses, and body position. I truly feel the program has benefitted my son for the positive. I would recommend this program to any parent who has a child with a neurological disorder. - Christina B.